Fruit carries through to palate and the moderate-to-moderate plus acidity helps bring the fruit to the forefront. The savory notes are also more prevalent on the mouth with good flavors of tea leaf and black coffee supporting the dark fruit and juiciness. The mouthfeel is full-bodied and rich with plush tannins supported by the moderate-to-moderate plus acidity. 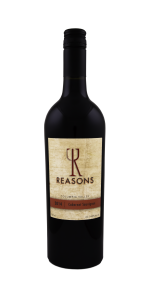 This wine is 100% Cabernet Sauvignon from four different A.V.A.’s and four separate vineyard sources. Thanks for checking us out. We'd love to add you to our mailing list. We promise to send interesting emails about wine and wine making, but not to do it too often.